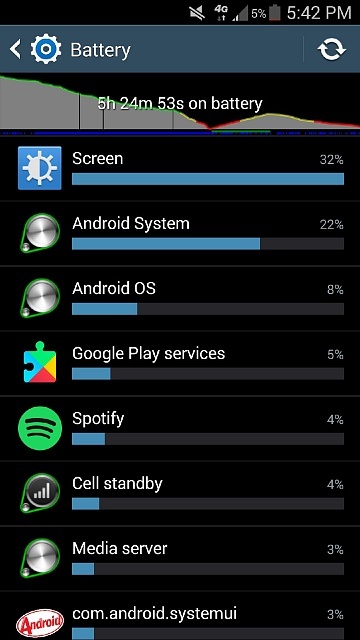 My Samsung Galaxy S4 has AWFUL battery life!!! I charge it every night with it shut off and when I wake up is goes from 100 to 96 in like 4 minutes. I keep the brightness all the way down and it still says 36% is wasting the battery life. I don't have wifi on, i dont have location on, I have a dark home screen and I turn it off in between uses and by the time I get home around 4 it is at 20% and I only turn it on at 9am!! I hate it and it is annoying every day and half the time I can't see the screen b/c it's so dark! How long is screen timeout? Is your signal always that bad? Probably 3 years but hasn't been used in a year. If the phone is 3 years old, the battery is just probably worn out. Li-ion batteries have around 600 full charge cycles. Typically this lasts around 18mo before this is used up. Then you start to see deterioration. Then when you stored it, some of the ions probably straight up deteriorated anyway. Basically you just need a new battery. I agree with chanchan05's diagnosis. Is tidal the best music streaming service? Can I use a european charger for my motorola droid 2?